Gulika also called as Maandi, holds a position of prime importance in the evaluation of a natal chart. Like Rahu and Ketu, having no physical existence it always makes a difference in the natal chart output. By nature it surpasses all natural or functional malefics. Gulika or Maandi In Vedic astrology, Gulika or Maandi are considered synonymous although some people consider them as different entity differentiate between them. Gulika denotes a certain segment of time ruled by Saturn. 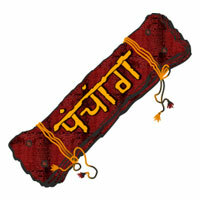 The word 'Maandi' is derived from Manda, another name of Saturn. According to the Brihat Prashara Hora Shastra नामान्तरं तु तस्यैव मान्दिरित्यभिधीयते। Fixing the Gulika The position of Gulika is different for daytime (from sunrise to sunset) and night-time (from sunset to sunrise). The duration of the day or of the night(as the case may be) is divided into eight parts. The segment belonging to Saturn is known as Gulika. For daytime, the first segment belongs to the planetary lord of the weekday on which Gulika is to be determined. The next segment belongs to the planetary lord of the subsequent weekday and so on till the seventh segment belongs to the planetary lord of the weekday that falls fifth from the weekday under consideration. The subsequent segments belong similarly to other planets that rule the weekdays in natural order. The eighth part here too is without a lord. In each case the part belonging to Saturn is called as Gulika. The Controversy Some people opine that the cusp for the ending moment of Saturn's part is the Gulika Sphut. However, this concept results in an erroneous understanding of the following shloka from the Brihat Parashara Hora Shastra. गुलिकारम्भकाले यत् स्फुटं यज्जन्मकालिकम्। गुलिकं प्रोच्यते तस्मात् फलं वदेत्।। That is : The cusp of the sign rising at the beginning of the Gulika segment is considered as Gulika. From this the chart must be analysed. Results of Gulika Gulika in the first house most certainly reduces the good results of the chart. The impact is maximum in terms of malevolence when the cusp of the lagna and the Gulika are close in degrees. This means that birth taking place at the commencement of the Gulika -Kaala suffers the maximum affiction. In such a situation, the Raja-yogas or other benefic yogas lose their potence. The phaladeepika states. गुलिकस्य तु संयोगे दोषान्सवंत्र निर्दिशेत्। • When the nakshatra of the lagna and Gulika are mutually trinal, the basic benevolence of the lagna nakshatra lord (LNL) is lost. Nakshatras 1,10 and 19 from each other are mutually trinal. Gulika spoils the benefic significations of most of the houses by occupying them. 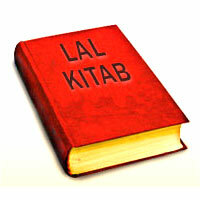 Thus, all troubles ensue when Gulika occupies the lagna. In the second house, it curtails family comforts and financial savings. Poor social status results when Gulika occupies the fourth house. In the fifth, it leads to troubles from progeny And so on. • Of all the sub-planets, Gulika and Yamakantaka (the sub-planet represented by Jupiter's segment) surpass all others in maleficence and beneficence respectively. 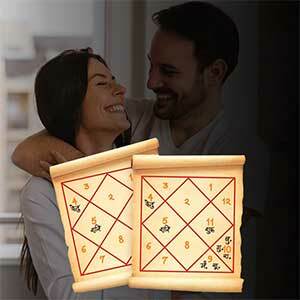 • Only in house 3,6,10 and 11 Gulika generates beneficial results. In the tenth house, however, it indicates delay in getting established in a career. • The good results of Gulika (from its placement in the above houses) are lost when the rashi and navamsha lords of Gulika are neecha (debilitated) or combust. Gulika with natural Karakas The association of Gulika with a natural Karaka always destroys the good effects of that Karaka. Classics hold the opinion that Gulika conjunct with the Sun creates lack of comforts for father, with the Moon it is bad for mother, and with Mars it is adverse for brother. when Gulika joins Mercury, the native becomes mentally disturbed. With Jupiter, the native becomes a hypocrite. Gulika with Venus brings troubles from women and ruins marital life. Association with Saturn leads to disease and skin disorder, with Rahu it leads to proneness to infection, and with Ketu fear from fire. 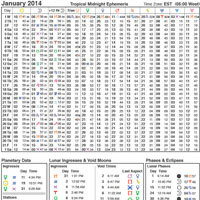 Gulika can alter the results of other planetary yogas in the chart. All good yogas are lost when the birth time and the gulika-kaala coincide together with another inauspicious factor like Mahapaata, Gandanta, Visha-Ghati, etc. (refer to our book : Panchadhyayee) A Special Rule A point 180° from Gulika is also considered as acutely malefic in the natal chart. This point must be taken into consideration when the lethal potential of a planet is to be determined. This is better known as the Pramaana Gulika in Vedic astrology. The dispositor of Gulika or Pramaana Gulika may prove fatal during its dasha, etc., displacing the other maraka or killer planets. Dashas and Transits •The dasha periods of the dispositor of Gulika or its navamsha lord may prove hazardous. •Gulika in houses 1,5 or 9 authorises the lagna lord to disburse the maraka effect during its dasha. •Trouble results during the dasha of a planet that happens to be an associate of Gulika in the rashi chart. •	Severe troubles are also likely during the dasha of any planet associating with Gulika in the navamsha or the dwadashamsha charts. •	Specially adverse results ensure during the dasha periods, of Jupiter or Saturn when they associate with Gulika in the navamsha, or the dasha of the Sun when it associates with Gulika in the dwadashamsha, or that of the Moon associating with Gulika in the Trimshamsha chart. • The Pramaana Gulika deserves the same treatment as Gulika (vide supra). •The transit of Saturn and Jupiter over the navamsha sign lord of gulika, that of the Sun over the Dwadashamsha sign lord of Gulika, and that of the Moon over the Trimshamsha sign lord of Gulika, put the native in trouble. This is according to the prashna Marrga, which states. मन्दोमुष्य नवांशपश्रितगृहे मृत्युप्रदायी गुरु र्भानुद्र्वादशभागपाश्रितगृहे त्रिशांशपक्र्षे शशी। • All trikona (1,5,9) rashis should be considered in application of transits. Gulika and accidents • Gulika is extremely important as an active killer in vedic astrology. It is used in the judgement of longevity, along with dasha and transit. • The latna, the Moon and Gulika falling in Dwiswabha (dual) or Sthira (fixed) signs prompt multiple ailments and fatality. In Chara (movable) signs, they lead to good health and long life. • The lagna, the Moon and Gulika falling in mutual trikonas in the navamsha chart, particularly in rashis 4,8 and 12 are fatal. Such a native is disease prone and accident prone. This is according to the following dictum of the Prashna Margga : अन्योन्यं यदि ते त्रिकोणभगता भागा महारोगदा दृष्टा मोहकरा युता मरणदाः कर्कित्रिकोणे दृढ़म्। Gulika and Longevity For the calculation of longevity, the lagna, the Moon, the Sun and Gulika are all important. A special rule for assessment of longevity involves using the cusp of the lagna and the longitudes of the Sun, the Moon and Gulika. This is as follows : Lagna + 5 +Gulika = Prana Sphut. Moon + 8 + Gulika = Deha Sphut Gulika + 7 + Sun = Mrityu Sphut When the sum of Prana and Deha is more than the Mrityu, the native is likely to live long. However, if Mrityu is bigger than the sum of Prana and Deha, a sudden end of life is indicated. In the chart of late Indian Prime Minister Indira Gandhi (November 19, 1917, at 23:11 hours IST : at 25° N27', 81°E51') the lagna is 3s27°22', the Sun is 7s04°07', the Moon 9s05°35' and Gulika 1s29°23'. The sum of Prana and Deha is 1s02°16' while Mrityu is 2s15°04'. The native met a tragic end. • Although Gulika is favoured in the third house, it turns death-inflicting when joined by or aspected by Saturn. • Gulika in the third with the Moon or receiving the full aspect of the Moon causes tuberculosis or other internal fatal disease. Daily Results of Gulika • Add the cusp of the lagna to the 'longitude' of Gulika. The month when the Sun transits the resultant sign leads to troubles and miseries. • The most hazardous day is when the Moon transits the sign obtained from adding the longitude of the Moon to that of Gulika. • Add the lagna, the Moon and Gulika. The resulttant 'rashi' is to be considered fata. The month, the day and the lagna indicated by the sum obtained above must be avoided in all major ventures. • Gulika may ensure successful conception when : (i) Gulika and the Moon are in the same sign, (ii) Gulika is with the fifth lord, (iii) Gulika is aspected by the fifth lord, (iv) Gulika is in the other sign of the fifth lord, (v) Navamsha lords of Gulika and the Moon are related mutually. 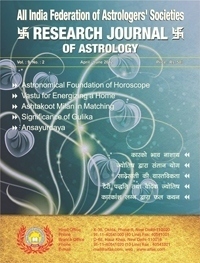 • A successful conception results when Jupiter transits the trines of Gulika rashi or Gulika navamsha rashi. When Gulika is in any of the first six rashis (Mesha to Kanya), consider the transit of Jupiter from the Gulika rashi. When it is in the last six signs (Tula to Meena), consider the transit from Gulika navamsha rashi. Raja -yoga from Gulika The Phaladeepika states. The dispositor of Gulika, or its navamsha lord, placed in a kendra or trikona, or in its own sign or in exaltation, nullifies the adverse effects of Gulika and gives yoga effects, though its lethal propensity (markatwa) would remain intact. To mitigate the Evil The evil of Gulika must be neutralised by prescribed remedies, Says Prashara : दीपं शिवालये भक्त्या गोधृतेन प्रदापयेत्। Prashara thus recommends that one should worship lord Shiva regularly in the evening, bow down to the Sun-god and lord Vishnu in the morning, and light a holy lamp of 'ghee' before Lord Shiva in a temple. This would defy the evil arising out of an adverse disposition of Gulika.